John Diaz (1846-1915) was a native of Tenerife, part of the archipelago known as the Canary Islands. Emigrating as a young man, he arrived in the United States sometime between 1862 and 1865 – during one of America’s most divisive periods – its Civil War. He then settled in Pennsylvania’s Philadelphia area, and found work as a cigar maker. By 1865, he was a Union Army private who was involved in helping his fellow members of the 47th Regiment, Pennsylvania Volunteer Infantry defend the nation’s capital following the assassination of President Abraham Lincoln. After mustering out with his regiment in Charleston, South Carolina on Christmas Day 1865, he then returned home to Philadelphia, where he resumed the trade of cigar making. On a New Year’s Eve – just three years after the war’s conclusion – he married Philadelphia native Anna Lambert (on 31 December 1868). Their family history is chronicled from this marriage through the death of John Diaz in 1915 in part one of this biographical sketch, Private John W. Diaz: Immigrant, Defender of the Union, and Successful Small Businessman. In part two, which begins below, the author continues her exploration of what happened to John Diaz’s wife and children following his passing. Death of John Diaz, 5 September 1915 and Widow’s Pension, Annie Diaz (U.S. Veterans Administration Pension Payment Card, public domain). According to U.S. Veterans Administration Pension Payment Cards, Civil War veteran and naturalized American citizen John W. Diaz died on 5 September 1915. Described as retired on the New Jersey state census conducted on 1 July 1915, he was survived by his wife, Annie, and their children – Gustavus, Adolph, Frank, John Jr., Marcie, Anna, Herbert, and Philip – and their grandchildren – Anna Rose, Adolph, Charlotte and Gus Jr.
John’s 66-year-old widow, Annie (Lambert) Diaz, continued to reside at their home in Ashland, Delaware Township, Camden County, New Jersey with their sons: Adolph, Frank, Herbert, and Philip (aged 44, 40, 34, and 24, respectively). All four of the sons were clearly still involved in the family business, having been described on the census several months earlier as cigar makers. By 1917, Annie Diaz’s sons Frank and John Jr. were also living in Philadelphia. John Diaz, Jr. was a resident of the city’s 9th Ward while Frank was employed as a machinist with the Large Dale Manufacturing Co. in Ashland, Camden County, New Jersey, according to their respective World War I draft registration cards. Frank was described on his paperwork as a man of medium build who had blue eyes and light hair, and whose nearest living relative was his sister, Anna R. Diaz, of Ashland, New Jersey. Private Philip Diaz, U.S. Army, 312th Regiment, Co. C, 1917 (public domain). The next year, Annie’s youngest son, Philip, who was residing with her at their 2nd Avenue home in Ashland, New Jersey, headed off to war. Having registered for the draft in Philadelphia on 4 June of the previous year, he had been helping to support his mother on the wages he earned as a clerk at Strawbridge and Clothier, a popular department store located on Market Street in Ashland. After enlisting as a Private with “4 Co. 153 Dep. 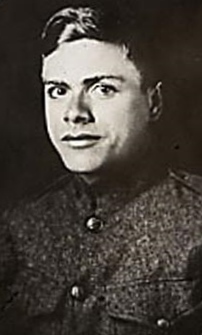 Brigade,” according to his World War I military records, Philip Diaz engaged in basic training at Camp Dix, New Jersey from 25 February to April 1918, and was then assigned to Company C of the U.S. Army’s 312th Infantry, 78th Division beginning in April 1918. Per those same records, he served overseas from 10 May to 28 October 1918 in “action operations” with the 1st Army, including engagements which occurred on 16 September, 4 October, and from 16 to 28 October. According to records of the First Presbyterian Church of Haddonfield, New Jersey (the church where he had confessed his faith in 1913), Philip Diaz and his fellow 312th infantrymen were serving in France during these overseas engagements. On 24 October 1918, he was reported as missing in action. Grave of Private Philip Diaz, Meuse-Argonne Cemetery, France, c. 2012 (public domain). The neighboring church of Ashland, N.J. honored the one soldier of the place, Philip Diaz, killed in the Argonne while seeking water for which he had been detailed, by dedicating a pulpit to his memory. Rev. H. M. Taxis, the pastor, made an address. * Note: According to The Princeton Seminary Bulletin, Vols. 11-13, Rev. Taxis became the pastor of the Presbyterian Church in Ashland, N.J. in 1914. 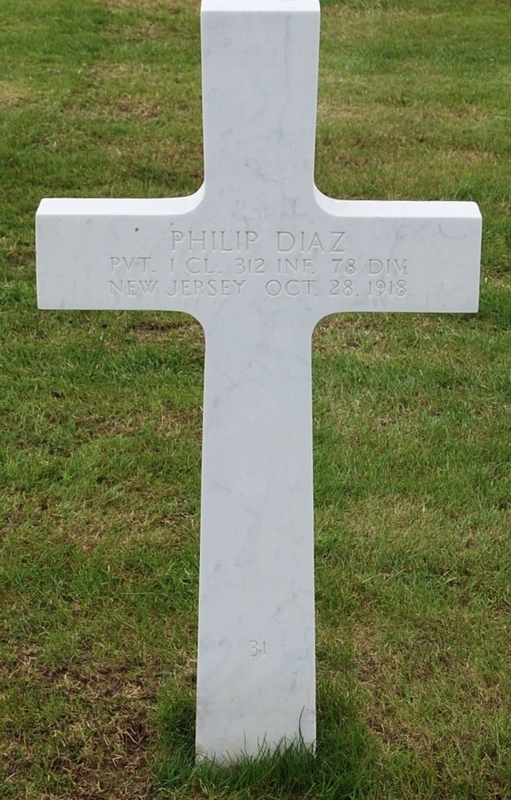 Private First Class Philip Diaz is one of the many Americans who lost their lives during those terrible days who were laid to rest at the Meuse-Argonne American Cemetery, Romagne-sous-Montfaucon, France. His exact burial place is the 31st grave in Row 5 of Plot G.
Head of the Diaz family in 1920 after being widowed by her Civil War veteran husband five years earlier, Anna (Lambert) Diaz continued to reside in Ashland, Delaware Township, Camden County, New Jersey. Living with her at this time were her unmarried sons Adolph, Frank and Herbert Diaz. Adolph and Frank were shown as cigar makers in 1920 while Herbert was shown as a laborer. Meanwhile, that same year (1920), Annie’s daughter – Anna (Diaz) Morton – and her husband, Herbert Morton, had also relocated to New Jersey. Residing with Anna (Diaz) Morton and her husband at 197 Haddonfield Road in Ashland, Delaware Township, Camden County were Herbert’s 67-year-old mother, Lidia, a native of New Jersey, and Anna and Herbert’s children: daughter Anna M. (aged 8, born in Pennsylvania; shown as “Anne Marcie” on the 1930 census), son H. Frank (aged 7, born in Pennsylvania), and daughter Lidia M. (aged 2, born in New Jersey). Herbert was employed as a switchboard manufacturer while daughters Anna and Frank were both attending school that year. In 1930, family matriarch Annie (Lambert) Diaz still resided in Ashland, Delaware Township, Camden County, New Jersey with her unmarried sons Adolph, Frank and Herbert, who were employed, respectively as a general salesman, cigar maker, and gardener. Widowed sometime prior to 1930, Annie’s oldest son Gustavus was residing alone in Voorhees Township, Camden County, New Jersey, and was unemployed, according to federal census records that year. That same year, Annie’s daughter Anna R. (Diaz) Morton and her husband, Herbert, were residing on Railroad Road in Ashland, Delaware Township, Camden County with their children: “Anne Marcie” (aged 19, a native of Pennsylvania), son Herbert F. (aged 18, a native of Pennsylvania), daughter Lydia M. (aged 12, a native of New Jersey), and daughter Dorothy R. (aged 9, a native of New Jersey). Herbert was employed as the Postmaster for Ashland, New Jersey while his wife, Anna – daughter of Civil War veteran John Diaz, was employed as the Assistant Postmaster. Two years later, Anna Morton’s brother John was gone. The namesake of their Civil War veteran father, John Diaz, Jr. had been suffering from cancer of the left mandible. He passed away on 31 January 1932 in Philadelphia, and was laid to rest at the Haddonfield Baptist Cemetery in Haddonfield, Camden County, New Jersey on 3 February 1932. By 1940, Anna (Diaz) Morton and her husband, Herbert, were still residing at their Railroad Road home in Ashland, New Jersey. Also living with them were daughters “Marcellina” (aged 28, shown on previous census records as “Anna M.” and “Anne Marcie” and Dorothy (aged 20), and 24-year-old lodger Charles White. Family patriarch Herbert Morton was working that year as a bookkeeper while daughters Marcellina and Dorothy were employed, respectively, as a teacher with the Delaware Township Public Schools and as a production worker at a local factory. Meanwhile, Anna’s oldest brother, Gustavus Henry Diaz, Sr. (aged 69) was still living in Voorhees Township, Camden County; however, by this time, he had moved into the home of his 31-year-old son, Gustavus Diaz, Jr. Also residing at this Diaz home was Gus Jr.’s 31-year-old wife Annie and their children: John (age 10), and Catherine (age 8). Two years later, the surviving younger brother of Anna (Diaz) Morton – Herbert Diaz – was documented as residing with their other older brother – Adolph Diaz – in Ashland, Delaware Township, Camden County. Their other brother – Frank (1875-1970) – had been a resident of Camden, New Jersey prior to his death in December 1970. Their sister Marceline (1879-1972) went on to marry and relocate to the Chicago area. Cook County, Illinois death records documented that Marcie Russell, a daughter of John Diaz and “Annie Lembert,” died at 628 Chestnut Street in La Grange, Illinois on 12 February 1972. “Heber L. Malecki” was the informant. A widowed housewife at the time of her passing, the Elliston Funeral Home handled her funeral arrangements. She was laid to rest at the Oakridge Cemetery in Hillsdale, Illinois on Valentine’s Day that same year. * Editor’s Note: The graves of Civil War veteran and family patriarch John Diaz and his wife, Anna (Lambert) Diaz, and several of their children have not yet been located, but researchers for 47th Pennsylvania Volunteers: One Civil War Regiment’s Story continue their search, and hope that descendants of the Diaz family or others researching this family line will reach out with information regarding their final resting places. 2. Dias, John, in Civil War Veterans’ Card File, 1861-1866. Harrisburg, Pennsylvania: Pennsylvania State Archives. 3. Diaz, Anna Rose, Gus Diaz, John Diaz, and Anna Lambert, in Birth and Christening Records. 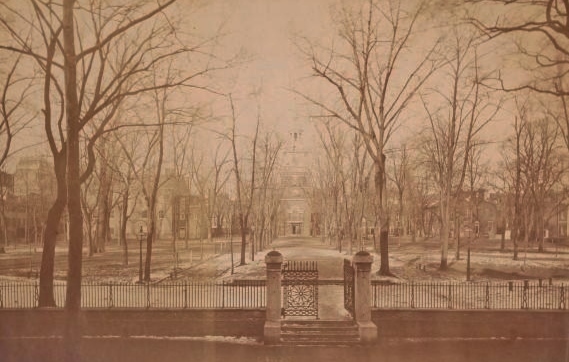 Philadelphia, Pennsylvania: Philadelphia City Archives and Historical Society of Pennsylvania, 14 December 1897 and 2 June 1905. 4. Diaz, Anna and Herbert Morton (marriage record). St. Michaelis and Zion’s Church Records. Philadelphia, Pennsylvania: Old Zion Lutheran Church, 1 January 1910. 5. Diaz, Frank, John Diaz, Jr., and Philip Diaz. World War I Draft Registration Cards. Washington, D.C.: U.S. National Archives and Records Administration, 1917-1918. 6. Diaz, Frank. United States Social Security Death Index. Washington, D.C.: U.S. Social Security Administration, December 1970. 7. Diaz, Herbert and Adolph Diaz. World War II Draft Registration Cards. Washington, D.C.: U.S. National Archives and Records Administration, 1942. 8. Diaz, John and Anna, Adolph, Frank, Herbert and Philip Diaz. New Jersey: Census of the State of New Jersey: Ashland, Delaware Township, Camden County, 1 July 1915. 9. Diaz, John W. (death date for John Diaz, Sr.) and Annie Diaz (widow and pension recipient) in Pension Payment Cards. Washington, D.C.: United States Veterans Administration, 5 September 1915. 10. Diaz, Jr., John in Death Certificates. Harrisburg, Pennsylvania: Commonwealth of Pennsylvania, Department of Health, Bureau of Vital Statistics, 31 January 1932. 11. Diaz, Philip. 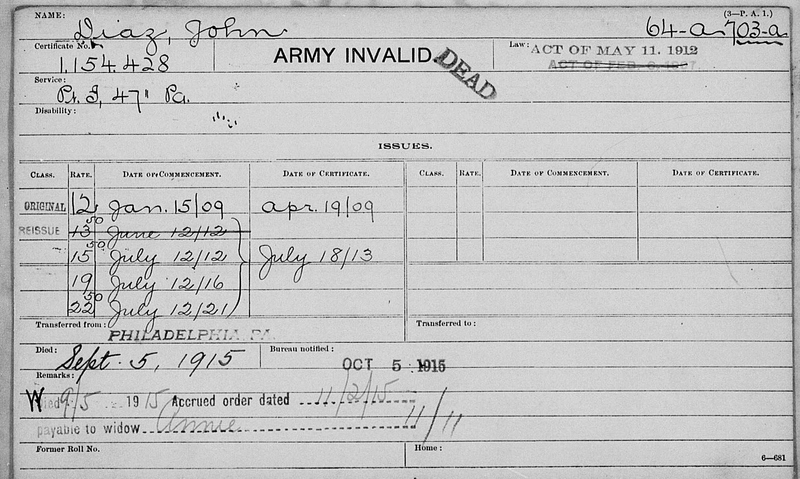 Enlistment, Service, Death and Burial Records. Washington, D.C.: U.S. Army and U.S. National Archives and Records Administration, 1917-1918. 12. Diaz, Philip. Profession of Faith Date, Membership and Other Church Records. Haddonfield, New Jersey: First Presbyterian Church of Haddonfield, 1913-1918. 14. Marcie Russell, John Diaz and Annie Lembert, in Death Records (La Grange, Cook County). Chicago, Illinois: Cook County Courthouse, 12 February 1972. 16. Morton, Herbert Ellsworth. World War II Draft Registration Cards. Washington, D.C.: U.S. National Archives and Records Administration, 1942. 17. U.S. Census. Washington, D.C., Pennsylvania and New Jersey: 1870, 1880, 1900, 1910, 1920, 1930, 1940. 18. U.S. Veterans’ Schedule (1890). Washington, D.C. and Pennsylvania: 1890. 19. White, W. P. Brief Items (description of how Private Philip Diaz was killed in action in France during World War I and dedication of church pulpit in his honor), in The Continent, Vol. 50, No. 39. New York: McCormick Publishing, 25 September 1919.